One thing that writers hate is to have their work be seen as horrible. No writer wants to be seen as not being a writer. There is something to be said for the amount of work it take to create something, submit something, and have someone tell you what you worked on is equivalent to snotty Kleenex and should be treated as such. As writer, I can tell you how hard it is to break out of this cycle of self-doubt and crippling creative anxiety over something your wrote. As an indie author, I can tell you what it’s like to write and have no one want to read it. As an editor, one of my jobs is to tell you what I think of your work. And how it can improve. As an editor, I get no joy out of telling another writer their work isn’t good or good enough. Read: THERE IS NO NEED TO BE MEAN TO THE PEOPLE WHOM SUBMIT THEIR WORK TO YOU. There is no need to tell people that don’t have the same talent for writing as you do how horrible they are at it. There is no need to eviscerate another writer. Just like every writer isn’t a writer, not every editor should be an editor. You have to be able to be a iron fist in a silk glove. You have to be able to do as I call salvage and save. You salavage the writer, this is tantamount. You save whatever part of the work you can. Even if that means you have to tell them what is not good–or unsalvageable. You have to be able to tell what is wrong with a work and how to make it better! Think of writing like being a martial artist of sorts. You work on the basics. You work on the mechanics. With every critique or criticism, let your skin get thick. Let the chatter fall away until you become deaf to it. You work at your craft. You work it. You hone your voice–this talent, this gift is yours. 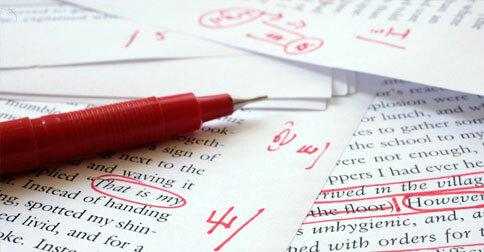 The strength of it is not determined by a red pen—or a rejection letter. I am of a certain age to remember when all grades were scrawled on notebook paper in fire red ink. I remember turning in papers, essays or other miscellaneous homework with the hope that the spillage of ink on those sacrificed papers would be at a minimum. It would be with deep offense when I would see something that I worked so hard on be bled all over. If you’re honest, this may be one of the reasons why you shy away from (if not outright avoid) submitting work. To blogs. To websites. Even to starting a blog. It is that fear that someone may not like something that you worked on, poured into may not be suitable to their palette. Criticism. Completely suggestive. Helps to build the vital thing you will need as writer: THICK SKIN. There are few rules in writing, and I speak of them often. They relate to spelling, grammar and those related mechanics. These are the unavoidables. These are the things you have to master in order to write or speak any language. They are unavoidable. It is the content where the thick of your problem comes. There are those whom will love, hate–or worse yet–not ‘get’ what you’ve written. Any criticism is good–people are reading your stuff! However, in the threads of this criticism, you cannot allow the negative (even hateful) portions of the criticism to take root in your heart. Not every criticism is meant to break you. Some are meant to improve upon what is already there. Constructive criticism builds! It wants you to be better! Malicious criticism tells you want you cannot do, and may never be equipped to do. Critique. These are similar to criticism, but focus on what is written. Not everything is for everyone. The faith of your talent cannot rest in what other people think of it. As a woman, a writer, and a writer whom is a woman of color, I have faced this more than once–before my skin got thick. I had to remember that what I write isn’t for everyone–and that too has to be okay. It must be okay! Feedback for writers is and will remain a touchy subject! Stephen King almost didn’t publish Carrie! Anne Rice couldn’t find a market for Interview With A Vampire right off. Langston Hughes contended with his aunt about his writing career. Laurel K. Hamilton when she began writing the Anita Blake series was criticized for her work–about how out the box it is and was. The point being that writing is what you make it. It is art and craft. It will always be of some contention. Someone somewhere will have something to say about it, not like it, not know how to classify it. They may even hate your manuscript as what happened to JK Rowling. This cannot stop you. The red ink cannot become a grave or a paralytic! For the people that don’t dig your stuff, there will be someone that will. That wishes they had something newer, fresher to read. Sometimes writers have to be their own advocates. You have to toughen up, sharpen your skills and above all write. Write. And by God, keep writing!